Metra recently announced a new public-private partnership to launch a reverse-commute service from Chicago to Lake County, Illinois. In spring 2018, a group of executives representing Fortune 500 companies with headquarters in Lake County, Illinois, faced a dilemma: Their businesses were hiring, but recruiters couldn’t find enough workers to fill openings in their suburban Chicago offices. In response, the employers hoped to tap into a bigger talent pool by expanding their recruitment target area to include Chicago residents. Known as Lake County Partners, the group includes big-name corporations such as Abbott Laboratories, Baxter International, Discover Financial Services, Tenneco Inc. and W.W. Grainger Inc. By reaching out to potential workers living in the city, recruiters did find more people interested in job interviews with those corporations. But once those recruits thought about the commute — the drive between Chicago and the county is about 45 miles — many declined the job offers. 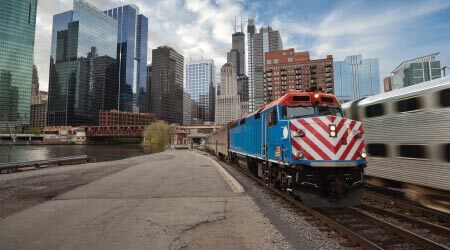 Realizing a hassle-free commute weighs heavily in many people’s decisions about where they choose to work, the Lake County business executives — joined by the Lake Forest, Illinois, mayor — approached the board of Chicago-based commuter railroad Metra to discuss a possible solution. Would Metra be willing to add a train or two to transport so-called “reverse commuters” from Chicago neighborhoods in the morning to jobs in Lake County and then back to Chicago in the evening? Their answer: Yes. That a community or employer would ask Metra to add service is not unusual. What made Lake County Partners’ request atypical is that its members are willing to help pay for it, says John Milano, Metra’s deputy executive director for administration. After a few months of negotiations, Metra, Lake County Partners and local governments announced in October that they had created a public-private partnership (P3) to test a reverse-commute rail service to Lake County. Under the agreement, the businesses and governments will share in the cost of the added service and a related infrastructure project with Metra. If successful, the P3 with Lake County will be a first for Metra, railroad officials say. It’s also an example of the many forms P3s can take involving passenger rail, says Art Guzzetti, vice president-policy for the American Public Transportation Association (APTA). Typically, P3s in transit rail take the form of “design-build-finance-operate-maintain” (DBFOM) arrangements, in which the public-sector agency contracts a private-sector company or joint venture to build the transportation infrastructure and service, then operate it. They also can take the form of long-term leases with private firms to operate the publicly owned transportation system; or business deals such as naming rights, in which a company funds the transportation service in exchange for its name or logo appearing on the transportation infrastructure or vehicle. “This is a very popular topic in transportation because the private sector is doing a lot of good things and there are more examples of public-private partnerships to take off on,” says Guzzetti. So far, the DBFOM approach has been “slow to take off” in the United States, Guzzetti says. Among the few that exist: the Hudson-Bergen light-rail system in New Jersey, which opened in 2000; and the more recent $2.2 billion Eagle P3 project to build the A, B and G commuter-rail lines in Denver. That P3 involves the Regional Transportation District of Denver (RTD) and a consortium known as Denver Transit Partners. A third P3 is underway in Maryland, where the Maryland Department of Transportation and Maryland Transit Administration are working with the consortium Purple Line Transit Partners to build, operate and maintain the Purple Line light-rail route from Bethesda to New Carrollton, Maryland. The consortium includes Fluor Corp., Lane Construction Corp., and Traylor Bros Inc.
A Congressional Research Service (CRS) report in 2017 noted that P3s haven’t been prevalent for a number of reasons, including the fact that states have limited experience with them. Other factors: the availability (or lack) of tax-preferred municipal bonds to state and local governments; and the need for a project to provide predictable revenue streams such as tolls, fares or taxes. So far, most transportation P3s in the United States have involved highways and marine cargo terminals, according to the CRS report. 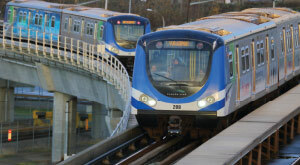 The Canada Line in Vancouver, British Columbia, is an example of a P3 agreement in Canada. However, the tide may be starting to turn for transit rail. The P3 format for financing, building and operating transit rail is undergoing a “rebirth” in Canada, Guzzetti says, noting the Canada Line — which is owned by TransLink and InTransitBC and is part of Vancouver’s SkyTrain system — as a prime example. Guzzetti expects to see more P3s emerging in the United States, too, as transit agencies seek innovative ways to meet a demand for new or expanded rail service. The potential benefits of P3s? They can attract private investment in public transportation infrastructure; the public sector can transfer some of the risk of building, financing, operating and maintaining infrastructure to the private-sector partner; and the private sector may operate the transportation system more efficiently than the public-sector partner through better management practices. The Federal Transit Administration (FTA) under the Trump administration supports the use of P3s and earlier this year published a final rule and a notice directly related to their use. In May, the agency issued the Private Investment Project Procedures final rule to help address regulations that might get in the way of using a P3 and private investment in a public transportation project. And in September, the FTA began soliciting transit project sponsors for a pilot program aimed at faster delivery of new transit capital projects that utilize public-private partnerships. Although the agency doesn’t have formal criteria for what constitutes a P3 agreement, it has published guidance on how FTA dollars or FTA-funded property can be used to generate revenue for public transportation in concert with private partners, an FTA spokesperson said in an email. The agency “encourages grantees to work with their FTA regional office as they develop projects in order to take full advantage of these eligibilities,” the spokesperson said. In addition, the FTA has partnered with industry research groups to study best practices in “value capture” agreements for transit-oriented development and other real estate ventures in or around public transportation infrastructure and facilities. “Value capture means that the value of the private property around your [train] station is enhanced because of the transit access or because of the transit hub, and the transit agency should benefit from that by capturing the increased value in the adjacent properties,” says Guzzetti. RTD-Denver used a P3 to help build part of its FasTracks rail program, including the line built to serve Denver International Airport. Denver Union Station — the hub of the city’s commuter- and light-rail services — is a case in point, he says. A tax incremental finance district was created to capture property and sales tax revenue from the increased value of real estate development springing up around the station. In turn, those proceeds have helped the city and RTD refinance about $300 million in federal loans related to the station’s redevelopment and construction of RTD’s FasTracks rail lines. As a result, the city and RTD will be able to pay off those loans earlier than initially expected. While the FTA is encouraging transit agencies to explore P3s and value capture arrangements, so, too, are many states. For instance, the Pennsylvania Legislature in 2012 passed Act 88, which transformed the way the Pennsylvania Department of Transportation (PennDOT) and other transportation authorities conduct business with private partners. In fall, Bonini’s office announced it will accept through Dec. 31 unsolicited proposals from the private sector that offer “innovative ways” to deliver projects across transportation modes, including rail, bridges and ports. The proposals also may suggest more efficient models to manage existing transportation services and programs, PennDOT officials say. One potential project for which PennDOT officials hope to find a private partner is a plan to update rail stations along Amtrak’s Keystone route between Harrisburg and Philadelphia. The first project entails relocating and rebuilding the Middletown station so that it meets ADA requirements. “We’re looking at P3s as an opportunity to provide some of the different services — maybe parking, maybe operations or maintenance of the station — and also transit-oriented development or commercial real estate as proposed and envisioned by the private sector,” says Bonini. P3s should be viewed as just “one tool” in a transit agency’s assortment of innovative options for funding transportation infrastructure projects, advises Guzzetti. U.S. Transportation Secretary Elaine Chao spoke at the groundbreaking ceremony held earlier this year for Maryland’s Purple Line project. In addition, the transportation project must be able to produce a predictable revenue stream for the private partner to successfully meet its goals under a P3 agreement. Public authorities overseeing a P3 also should be prepared to address problems that may arise later in the relationship. Consider Denver’s Eagle P3 project, which until recently has been cited as a P3 success story. 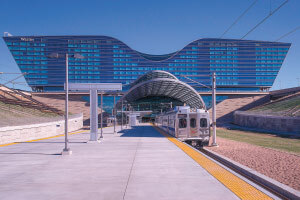 In September, the partnership became mired in litigation after RTD was sued by Denver Transit Partners (DTP), the consortium of companies responsible for building and operating the A Line between Denver Union Station and Denver International Airport; the B Line to Westminster; and the yet-to-open G Line to Arvada and Wheat Ridge. In its lawsuit, DTP claims that RTD is withholding payment for services rendered, and is seeking additional payment from the district. RTD has countersued, blaming DTP for ongoing problems on the A Line, which opened in April 2016. 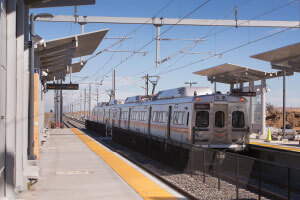 Prior to the district’s legal problems with DTP, RTD officials long had praised P3s as a way to fund large, expensive transit-rail infrastructure projects. Still — as is the case with any project delivery method — a P3 offers a set of lessons learned, according to RTD General Manager and Chief Executive Officer Dave Genova. Meanwhile, Metra officials in Chicago are working out the details of the railroad’s two-year P3 pilot project with Lake County Partners. The project calls for adding two trains to the Milwaukee District North rail line and to work on a definitive agreement to share the $4.75 million cost of installing a universal crossover near Lake Forest. The crossover would lead to even more opportunities for enhanced service, Metra officials say. During the two-year demonstration service, Metra and the group will evenly split the $1.4 million cost of operating one new reverse-commute train in the morning rush hour and one in the evening. As for the crossover, the business partners would pay $2.75 million, Metra would contribute $1 million and local governments would fund $1 million toward that project’s cost. Denver’s A Line was built as part of the RTD’s Eagle P3 program. Metra officials anticipate the new service will start in mid-to-late January. Whether it’s judged a success will depend on the net increase in riders and the amount of fare-box revenue it produces. Metra also will gauge how many riders migrate from the existing Union Pacific North Line to the new reverse-commute service. Reverse-commuting is happening in other major cities and Milano expects the trend will spread. He hopes the arrangement with Lake County Partners will help Metra better serve the greater Chicago region.